The Cub Scout Space Derby took place on Saturday, January 12. The Garden Club of Shelter Island’s Operation Daffodil celebrated its seventh year with Cub Scout Pack 56 planting 100 King Alfred Daffodil Bulbs on Saturday, November 10, at Prospect Park. They’ve planted over 2,000 King Alfred Jumbo Daffodils throughout the Island. Jean McClintock and Tim Purtell oversee the program. From left, Monica Klenawicus, Jasper Samuelson, Lucas Reiter, James Cummings, Johnny and Dave Gurney. 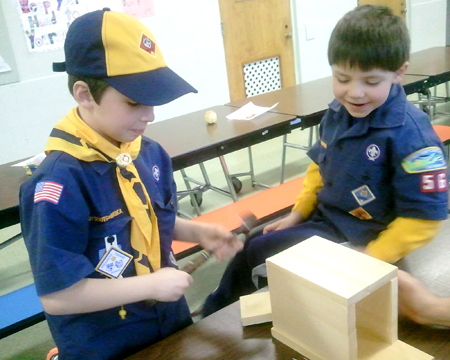 The Wolf Cub Scouts were busy building birdhouses in the school cafeteria last week with their leaders Deb and Rob Schack. Intent on their project were Michael Surozenski (left) and Evan Schack.